The GI SPEC LC-II ALICE Complete Pack Frame from Tru-Spec is an exact copy of the one used in the US military issue ALICE pack. The sturdy metal frame ensures optimum load distribution when the pack is attached. It comes with all of the necessary pads and straps. 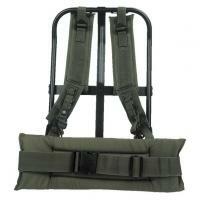 The shoulder straps are made from high-strength ballistic nylon, and are easily adjustable for a secure, custom fit. The waist strap provides an extra point of attachment for additional stability while in motion. It is also adjustable, and comes with thick padding for the lower back to make it more comfortable to wear.